Ask questions and share your experiences with hiking & backpacking gear, and share trail recipes and gadget tips. Please see classifieds forum for buying/selling stuff. So I'm really getting into preparing me and my family for some backpacking trips, and it seems most of the advice the Internet has to offer insists on keeping my pack down to 10 lbs and taking out a second mortgage to pay for it. 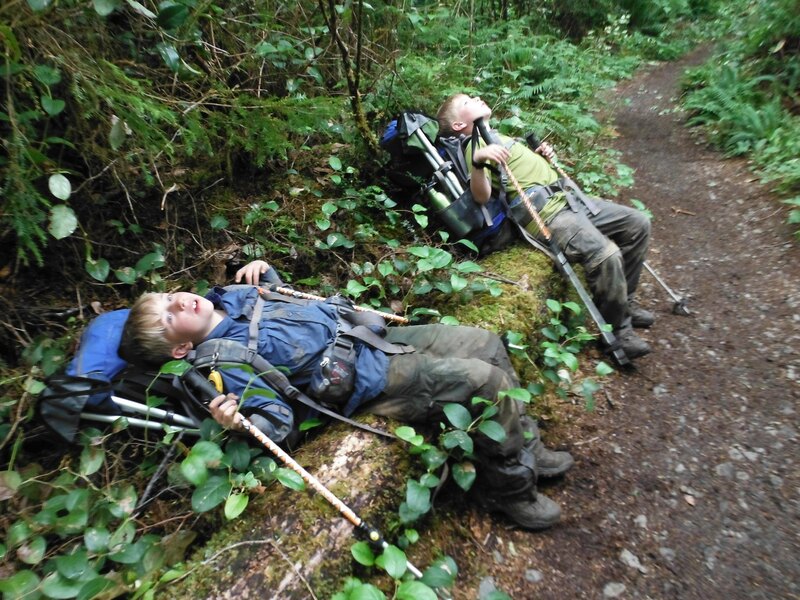 My recollection as a kid was just taking the heavy old sleeping bags and tents we already had with us on the hike. So what do you all think about this? Is that kind of cost and investment only for those who put thousands of miles on the trail each year? Is it necessary for someone who is getting kids into the outdoors and doing relatively short hikes (although I might do some up to 20 miles)? Am I going to regret a tent that weighs five lbs and a sleeping bag that weighs the same? Interested to hear the experiences of those with more recent trail experience. After a long break from backpacking I returned to it a few years ago & thought I could just do what I used to do in my 20's which was take everything but the kitchen sink in 50lb frame pack into the Wilderness. I went round mt Hood several times like that in the 80's & early 90's! Sadly I soon found I couldn't do that any more! I don't have any light weight gear though as I only go out a couple of times a year though they can be 30 plus mile trips over 2 or 3 days. Now I just use regular hiking stuff (my tent weights 5 pounds) but I just keep my pack at around 35lbs (That always includes a beer for each day though:) I really think how light you need to go just depends on what you need to do to be comfortable. I certainly wouldn't buy a bunch of stuff up front. Thanks for the reply! Unfortunately for now, I think I'll be the one carrying most of the stuff since my kids are still relatively young. matimeo wrote: So I'm really getting into preparing me and my family for some backpacking trips, and it seems most of the advice the Internet has to offer insists on keeping my pack down to 10 lbs and taking out a second mortgage to pay for it. My recollection as a kid was just taking the heavy old sleeping bags and tents we already had with us on the hike. its not worth it unless your going to put thousands of miles on the trail each year, and its not worth it to let the kids use the expensive stuff. If you get into it more you can replace older heavier gear with lighter gear as you go. Also keep in mind that true UL / "10lb baseweight" backpacking leaves out a lot of luxuries and is more of a discipline... fine for a thru hiker, maybe not so much for getting the kids out or enjoying a weekender with friends in a scenic place. Minimal Cost Backpacking gear list.. I'm not into categorizing, like weight has to be less than 12 pounds or whatever. But there are a lot of good ideas for reducing weight. Some cost a lot, and some little. Just do what works for you. Don't buy a 5 pound tent or sleeping bag. I still have mine, because I'm a hoarder. One idea is to not take stuff you'll never use. Like extra sets of clothes, or too much fuel, food, or water. But you do want to include stuff for survival situations. I've created a little spreadsheet of the gear that I already have and gotten a rough number on what my weight would be if I went backpacking tonight. This includes a 7.5lb pack (Dana Designs K2 longbed, $20 at garage sale) which I could probably use one of my lighter packs for a short trip, a sleeping bag that weights 4.5lbs (already had it, $30) and a three person tent (for me and kids) that weighs in at 5.8lbs (bought quite a few years ago for $30). Total weight including 40oz of water comes to under 36lbs, which isn't too bad; about 19% of my body weight. I can see some spots where I could possibly trim weight over time, but I think I could manage a three mile backpacking trip with my kids with that kind of weight. There's some great advice already here so I won't add too much to it but when my wife became disabled due to a brain disease, we lost her income and our ability to go on vacation became severely compromised with all the new medical bills. We got into camping and hiking for that reason and that morphed into interest in backpacking trips of 1-3 nights. With a limited budget, we hit a couple of the REI used gear sales for sleeping pads (most are easily repaired if they claim to leak) and backpacks (just make sure they fit well before you leave the store, as they can't be returned) and then bought new sleeping bags on backcountryedge.com and a tent on Amazon. The previous season's models can usually be found quite cheap, especially at this time of year. Most of the other gear, including a little $6 backpacking stove, we also bought on Amazon. We skip luxuries like the tiny chairs and pillows and use our existing packed clothes instead. We do a lot of river hikes so we bring less than a liter of water and filter the rest with a Sawyer Mini (which you can buy for ~$20 pretty much anywhere). Our pack weights for a trip for us and the dog are about 22 for me and 13-14 for my wife. We are comfortable with that weight, as we aren't hauling it 10-15 miles over rough terrain. Basically, buy what you can afford now that will last you a few years before you start swapping out gear for lightweight options but be aware of the controllables, too. We don't count every ounce, and do take a few items that we may not need but that enhance the experience for us at a low weight penalty. The main things that can add up to sneaky weight are excess clothing, toiletries, and way too much food. Take dehydrated and lightweight and nutritious food options (quinoa-based meals are super lightweight!) and leave the excess food, water, clothes and toiletries in the car so you can change after the trip. These things have allowed us to still have fun and quality gear that will last, without breaking the budget. We do between 2-5 trips per year, depending on how my wife is feeling. Our best memories in ten years of marriage have been gained from our backpacking trips. Here's a pic of my wife and our dog in Indian Heaven earlier this year. I hope you can find a solution that fits your family's needs . Seriously, the lightweight advise is good to consider. The reality is that most backpackers are carrying more than 10lbs. Starting out is the worst with having to purchase a big enough tent tent, sleeping bags, backpacks, etc. We used to have a lot of heavy gear. My beginning backpacking tent weighed 12lbs by itself. Over time I have purchased lighter gear a little at a time by watching for sales on the gear I want to upgrade. My kids now carry their own tents, climbing helmets, pads, etc and their packs weigh less than they did when we started. My pack weighs considerably less. There are also good sites out there that have deals if you can be patient. I've also seen lightweight packs like ULA's Catalyst (3lbs and 65L capacity) on Craigslist. You can also make your own lightweight synthetic quilts that are significantly lighter than the normal sleeping bags if you have some skill in sewing. You can do a lot even with your heavy gear: there are lots of places to backpack around here that have campsites relatively close to the trailhead. In this case, you'd have a heavy hike in, set up camp, and then be able to day hike with just the daytrip portion of your gear. That's backpacking, too! There's also the car camping option. Lots of campgrounds are right at the trailhead (like Green Canyon Campground on the Salmon River), and would allow you camping and dayhiking, too. Another behavior modification that can help would be to only go backpacking in good weather. For instance, in dry weather, you can save lots of money by using cheap rain gear. You can get cheap and pretty lightweight rain gear at the Army Surplus store near Next Adventure. It doesn't breath, but if you're not moving too fast, it'll keep you dry, so it's a perfect way to cheaply ensure safety at a time when you don't expect to spend a lot of time in the rain. If you're dead set on backpacking in the rain (blahh), then you're kind of obligated to get really high functioning rain gear, which is expensive. Same kind of thing with snow camping and winter camping. I've spent thousands of dollars on outdoor equipment, but most of that was skis and bikes. The lightweight backpacks and tents and sleeping bags (the big three of ultralight travel, in terms of cost and weight) don't have to be that expensive, though they sure can be. You can even make some of it yourself, if you're handy with a sewing machine! That was Ray Jardine's whole approach. I hope you're able to find gear and trips that allow you to introduce your family to backpacking in such a way that doesn't break your back or your wallet. Best of luck!